With cash flow almost normalising after demonetisation, customers on Friday thronged jewellery shops across the country to celebrate Akshaya Tritiya. "We are seeing good footfall in our stores. In the last two months, after demonetisation, people have again started buying gold. We expect sales to go up by 40 per cent this Akshaya Tritiya compared to last year as prices are almost at the same level," Balram Garg, Managing Director, P.C. Jeweller, told IANS. Gold price hovered around Rs 29,000 per 10 grams for 24-carat purity in the national capital on Friday. Akshaya Tritiya, a holy day for Hindus and Jains, is believed to bring good luck and success. It is considered to be an auspicious day to bring home gold and ornaments. "Millions of Indians believe that purchasing gold on Akshaya Tritiya brings good fortune. 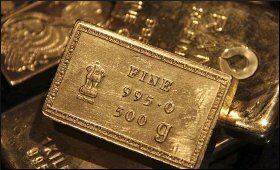 The festive sentiment among both trade and consumers appears to be stronger during this Akshaya Tritiya, as the industry is emerging steadily from a period of sluggishness faced during and immediately following demonetisation," said Somasundaram PR, Managing Director, India, World Gold Council. Buoyant gold sales on Akshaya Tritiya brought cheers to jewellers in Mumbai as well. Retail outlets saw crowds as people made their customary festive purchases on Friday morning. All India Gems & Jewellery Federation President Nitin Khandelwal said the trend to buy gold started since Gudi Padva in March and was continuing owing to the ongoing marriage season. "There are significant crowds in jewellery shops all over and people, more than 75 percent (of visitors), are opting for big and small items of gold jewelleries," Khandelwal told IANS. He said till noon, the sales were an estimated 18-20 percent higher compared to last year. Mumbai Jewellers Federation President Rakesh Shetty said given the crowds, especially in suburbs, the gold sales could surpass even the Gudi Padva sales. "Today, the gold prices are Rs 29,300 in Mumbai, coming down over the past few weeks. This has encouraged customers. They are buying both jewellery and coins," Shetty told IANS. "On this Akshay Tritiya, jewellers have so far seen 15-20 per cent growth in sales both in terms of volume and value for gold and silver. The standalone stores also noticed reasonable growth in sales," India Bullion and Jewellers Association's spokesperson Pankaj Parekh told IANS in Kolkata. He said gold price may shoot up soon following international tensions. So, Akshaya Tritiya is being seen as the right time to buy gold. Compared to last year's Akshaya Tritiya, the price of gold now is relatively low. The yellow metal's price was over Rs 30,000 per 10 gm in 2016. "Similarly, silver price remains at a lower range at Rs 40,000-41,000 a kg, which is conducive for demand," Parekh said. Bengaluru was no exception. While many people bought gold to ring in good tidings, others chose jewellery as an investment. Some jewellers in Bengaluru felt that demonetisation and restriction on cash payments would continue to affect the sale of gold jewellery and ornaments. "The footfalls are good in jewellery shops in Chennai. The trade will do business like last year. There were initial fear that demonetisation would have an impact on sales. But it is not so," Jayantilal Challani, President of Madras Jewellers and Diamond Merchants Association and a Pprtner in Challani Jewellery Mart, told IANS. Driven by positive consumer sentiments and demand recovery, TS Kalyanaraman, Chairman and Managing Director, Kalyan Jewellers, said: "Kalyan Jewellers should witness 10-15 per cent growth in revenues during this Akshaya Tritiya compared to last year based on present trend of purchases." Besides traditional stores, even the online portals saw good traction. "Considering the pent-up demand in the market, we are expecting a 100 per cent jump in sales leading to the auspicious day. Our manufacturing and logistics teams have already been strengthened to cater to the festival demand," said Gaurav Singh Kushwaha, founder & CEO of online jewellery store BlueStone.com.